This Series Is A Tribute To EnglandS First Porcelain Manufacturers Dating Back To The Mid-18Th Century. Factories Of The Time Developed Down Product For The Aristocratic Market. Although Many Are No Longer In Operation, The Techniques Used Then Still Apply Today Of Hand Working Molds And Patterns. The Strength And Non-Porous Nature Of Porcelain Allow Intricate Details And Shapes As Evidenced In The Exquisite Flowers Accenting This Series. This Collection Has Crystal Accents And Intertwined Branches Finished In Deep Rust Or Cream. The Pink Rose Has Long Been Associated With Poetic Romance And Gracefulness, But It Also Means Light-Heartedness And Fun. This Collection Will Appeal To Your Love Of Passion And Romance, As Well As Your Playful Side. 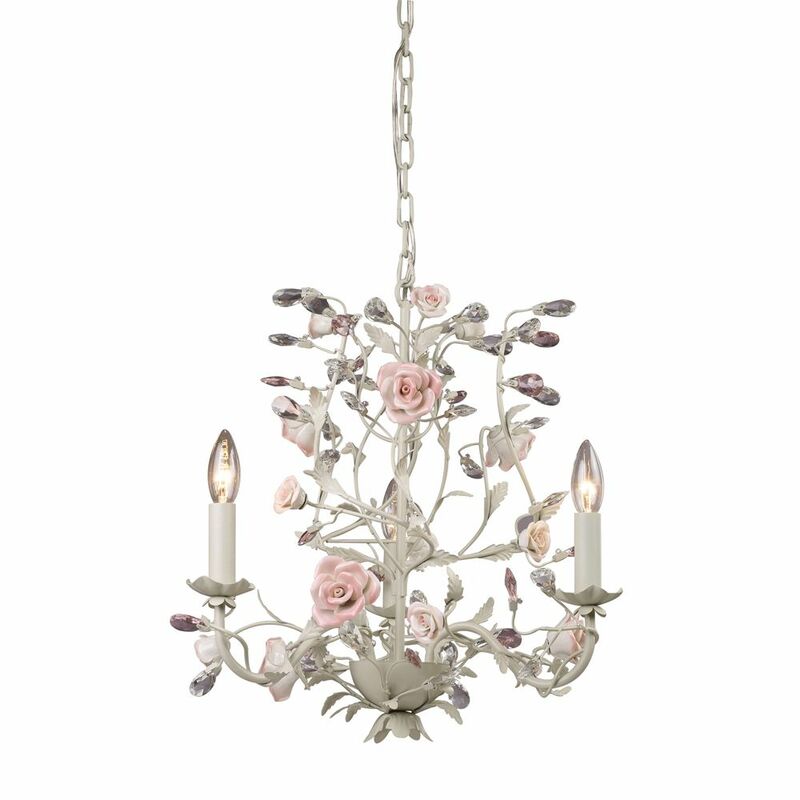 Deep Pink Roses Are Complemented By Light Pink Crystal Accents And An Antique White Finish. 3 Light Ceiling Mount Cream Chandelier This Series Is A Tribute To EnglandS First Porcelain Manufacturers Dating Back To The Mid-18Th Century. Factories Of The Time Developed Down Product For The Aristocratic Market. Although Many Are No Longer In Operation, The Techniques Used Then Still Apply Today Of Hand Working Molds And Patterns. The Strength And Non-Porous Nature Of Porcelain Allow Intricate Details And Shapes As Evidenced In The Exquisite Flowers Accenting This Series. This Collection Has Crystal Accents And Intertwined Branches Finished In Deep Rust Or Cream.